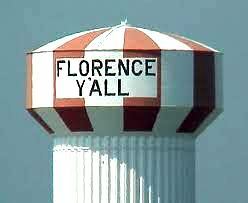 Welcome Y'ALL to the Florence Community Chat Area where you'll find lots of info about schools, parks, events, neighborhoods, businesses, people, places and so much more! In case you are considering moving to the Northern KY area, you just might want to check out this vibrant city. You'll be secure in knowing that there is a state of the art medical facility at St. Elizabeth hospital, a whole host of parks to enjoy the outdoors (including Stringtown, Lincoln Woods, South Fork and Orleans parks), an entire shopping district on Mall Rd complete with the main anchor of Florence Mall, a hi-tech movie theater called "Rave" and a long parade of specialty shops and dining establishments throughout the city. Just click below for more information on Florence...and don't forget to check back soon because this site will keep on growing and evolving thanks to readers like you who continue to ask me questions about all things related to Florence! ★Trivia: How big is Florence? ★Parks in Florence KY..It's about time for a nature break!